The final day of my winter season and what a stunning day it was. 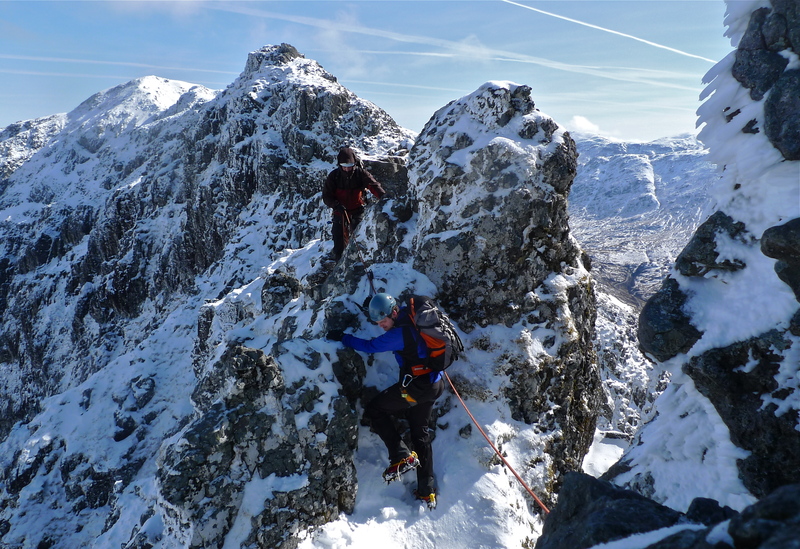 A traverse of the Aonach Eagach ridge under blue skies, bright sunshine, zero wind and crystal clear views. 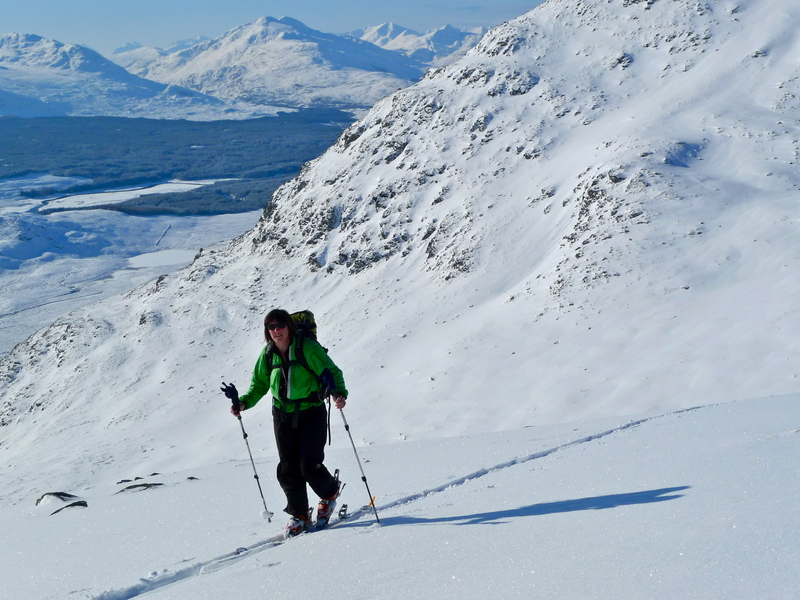 Winter mountaineering does not really get any better than this in the UK. It was one of those days where crampons were needed but with so much rock still showing they often felt more of an annoyance than beneficial. 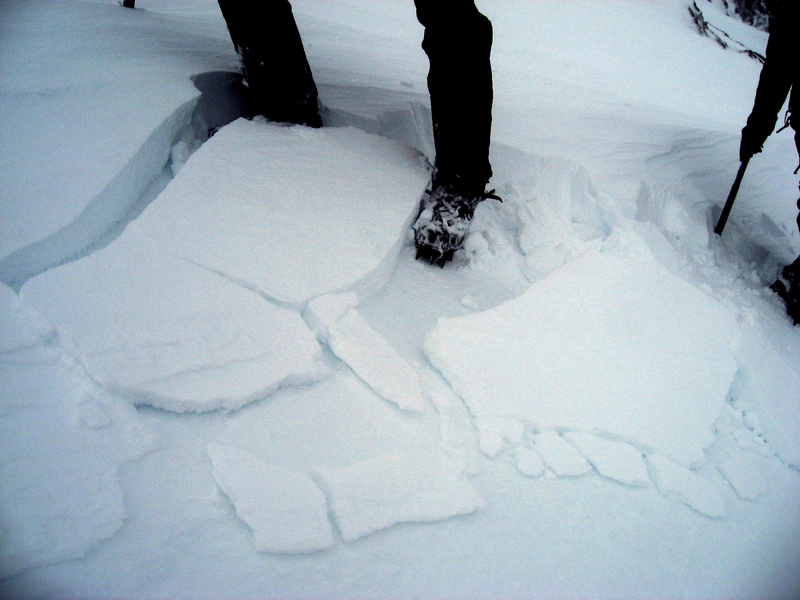 At least one team managed a traverse today without crampons at all – not something I would have been keen to try. The air clarity really was crystal with Ben Nevis, Grey Corries and the Mamores looking particularly specatacular in there full winter coat. It certainly looked more like mid Feb rather than early April. As I drove home I felt quite sad to be driving back home to Wales tomorrow, however I am more than ready for some sunny rock climbing again. 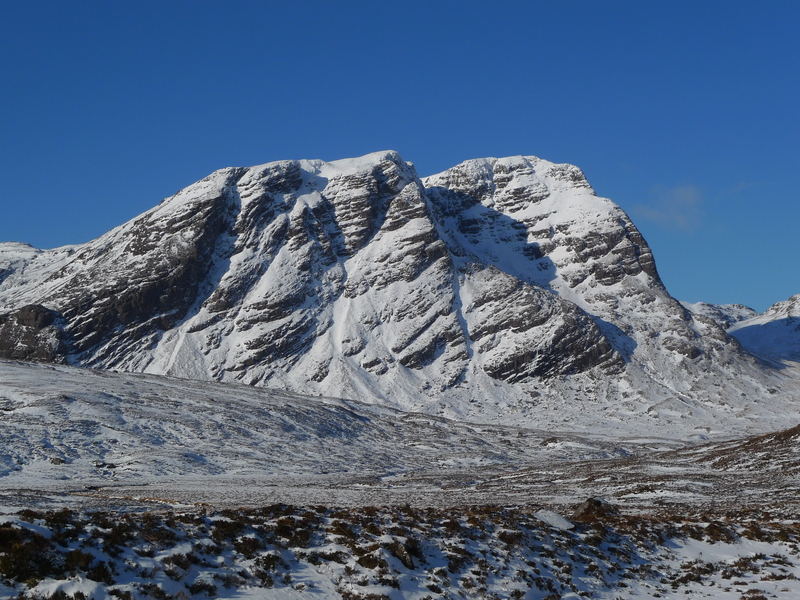 Plenty of space for summer climbing, scrambling and navigation courses this spring. Please get in touch with your ideas. The freezing level was forecast to be 900m today. It wasn’t! 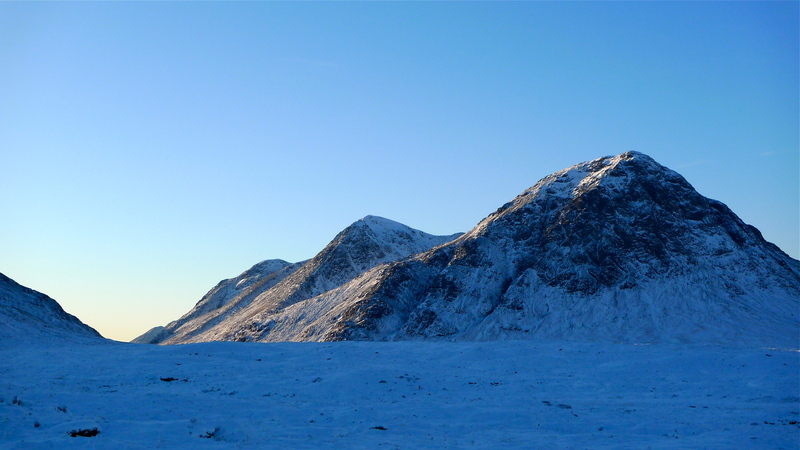 Andy and I walked into the Ben and had thoughts of Point 5, Vanishing Gully, Minus 1. A cup of tea at the CIC hut while the drizzle eased also seemed to have the effect of diminishing the team psyche. A short day was required so we headed for Vanishing Gully. And indeed it was vanishing. Melting almost faster than we could climb it. Not sure I have ever climbed such mushy ice before. Very unlikely to last the rain and thaw predicted for the next 2 days. Its seems that higher up the mountain things were much better. 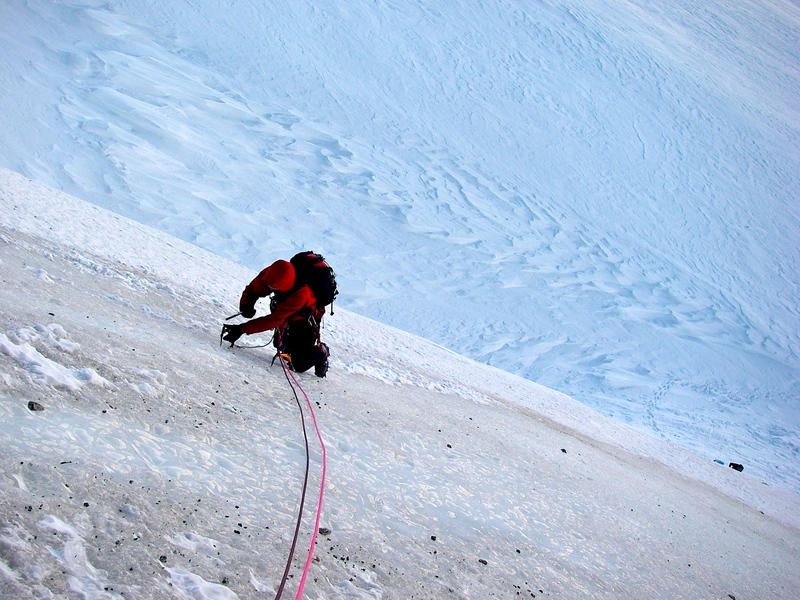 1 team told of good conditions on Zero gully and another said Thompson’s route was great. There was a procession of teams up Orion face all day and teams on NE Buttress, Observatory ridge, Point 5 and Tower Ridge. Its forecast to rain all day Thursday with freezing level well above the tops so we will have to see whats left come the weekend. Today Luke, Rachel and I were supposed to be climbing in the Cairngorms. However ‘swimming’ or skiing were the only options really available there so we decided to make a day trip to the NW Highlands. We settled on the hills above Strathcarron and hoped to go and have a look at either Post Box Gully or Academy Ridge on Sgorr Ruadh. The walk in was incredibly beautiful through the old stands of Scots Pines then up into Coire Lair surrounded by the shapely munros of Beinn Liath Mhor, Sgorr Ruadh and Fuar Tholl. We headed to the foot of Post box gully but unfortunately the way to the foot of the route was barred by a very large drift of deep windslab. So instead we played around on some ice bulges in the corrie before ascending central couloir which was more scoured. The views from the summit were incredible especially looking north to the Torridon group. 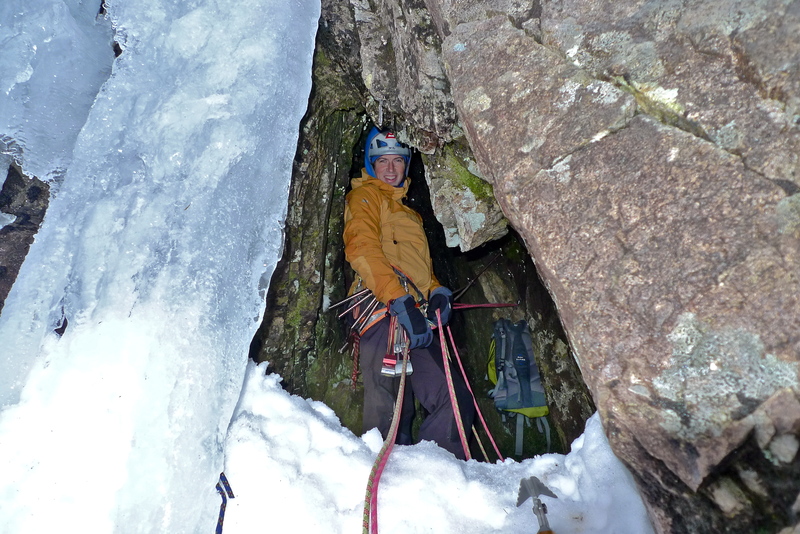 There is certainly far less snow in the area than either the Cairngorms or Lochaber and many routes look do-able but there are still pockets of slab that require avoiding. Teams were out the day before climbing on Mainreachan Buttress on Fuar Tholl. The photo shows evidence of multiple crown walls and avalanche debris on the west flank of Ben Nevis above the half way lochan (Click on the photo to enlarge it to see a clearer view). They lie on the slope due west from the summit of Carn Dearg and just north of the Red Burn. The lower stretch of the tourist route can be seen bottom left of photo. The photo was taken from the road in Glen Nevis this afternoon from where the crown walls were clearly visible with the naked eye. Last weeks cold spell coincided with very little wind and allowed the growth of large areas of surface hoar crystals which covered the snow surface on most elevations and aspects. See second photo for example of these crystals. 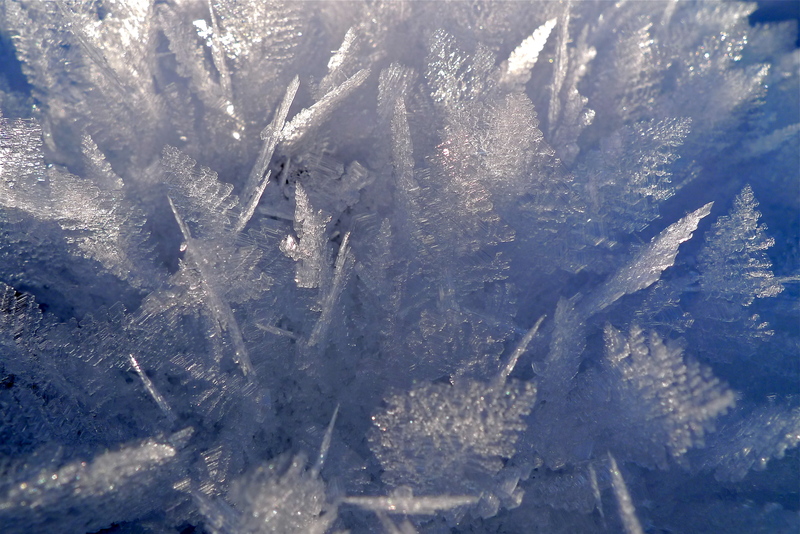 Surface hoar crystals are not that common in scotland and in themselves are not dangerous. However if they get buried by a subsequent snowfall before being destroyed by wind or a thaw they create a very weak layer in the snow-pack. Wednesday and Thursaday saw fresh snow fall which initially fell on light winds covering the surface hoar. Subsequently a strong North Easterly wind has blown which has transported a lot of snow and created large areas of windslab overlaying the surface hoar especially on South through West to NW aspects. Our strong winds more commonly come from the SW so we get more used to seeing windslab on northerly to south easterly aspects. The west flank of Ben Nevis is commonly very scoured of snow but the above photo shows that conditions are far from normal at the moment. 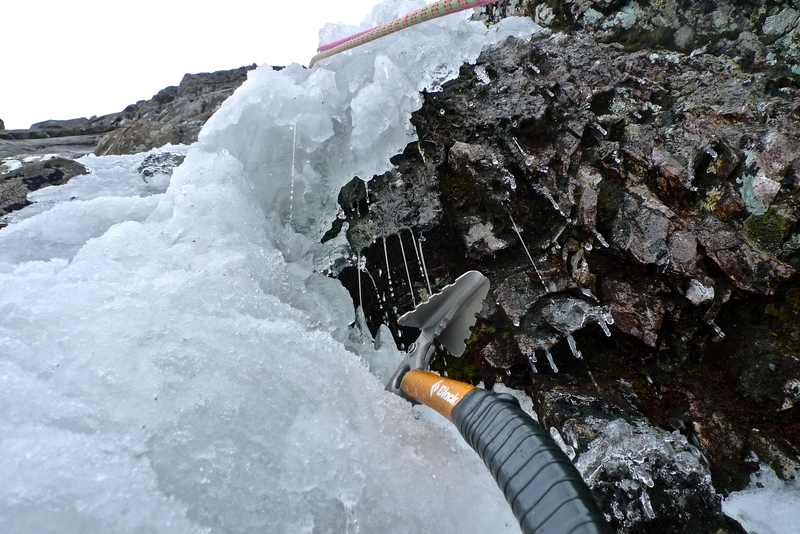 Slopes that in a ‘normal’ winter might be scoured may well be very dangerous at present. The buried surface hoar will not be destroyed until there is a heavy thaw or rain that penetrates through the snowpack. Route choice and travel require very careful consideration in the present conditions. Please be very cautious. OK so today was a much needed rest day which gave me the time to put together a little film of the day skiing at Creag Meagaidh. Not much more to say than in the previous blog entry other than it was as good a day as I’ve had skiing anywhere. Hope you enjoy the vid. Without over statement today was one of those once in a lifetime days on the hill. Catrin and I went for a ski at Creag Meagaidh. We parked the car crossed the road and clipped straight in to the skis for the skin up. A bit of heather bashing and then we were skinning up fresh powder up the Allt nan Cearcall between the Moy Burn and Moy Corrie. On the summit there was not the slightest breath of wind and we could not stop giggling at the thought of the ski back down that lay ahead of us! I’ll let the pictures and movie speak for themselves – it really was as good as it looks. If I get the time I’ll try and put a small film together of the other photos and movie clips of the day and put it online soon. A change of scene this week. Monday and Tuesday I was out with Joe, Jake and Joe’s Dad, Robert in the Northern Cairngorms as an introduction to winter skills. 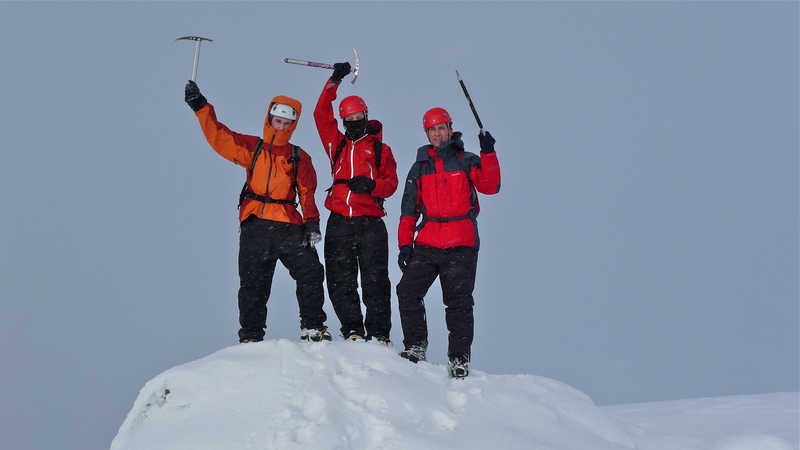 Monday we were in Coire an t-Sneachda covering the use of ice axe and crampons and introduction to avalanche assessment as well as building on their existing navigation skills. Being half term it was very busy both on the ski area and in Sneachda. Climbers were mainly sticking to the easier routes and everything still looked very buried with belays and runners very hard to find. On Tuesday we decided against the rush to get into the ski area car park before it filled and go off in search of somewhere quieter. As we left Aviemore for Glen Feshie it was snowing heavily with a couple of inches on all the roads. We planned a round into Coire Garbhlach and over the top to the summit of Carn Ban Mor before returning to Glen Feshie. As we set off the snow stopped and the visibility slowly improved. The scenery in Coire Garbhlach was spectactular and we found patches of hard neve which had been absent yesterday to practice skills on. 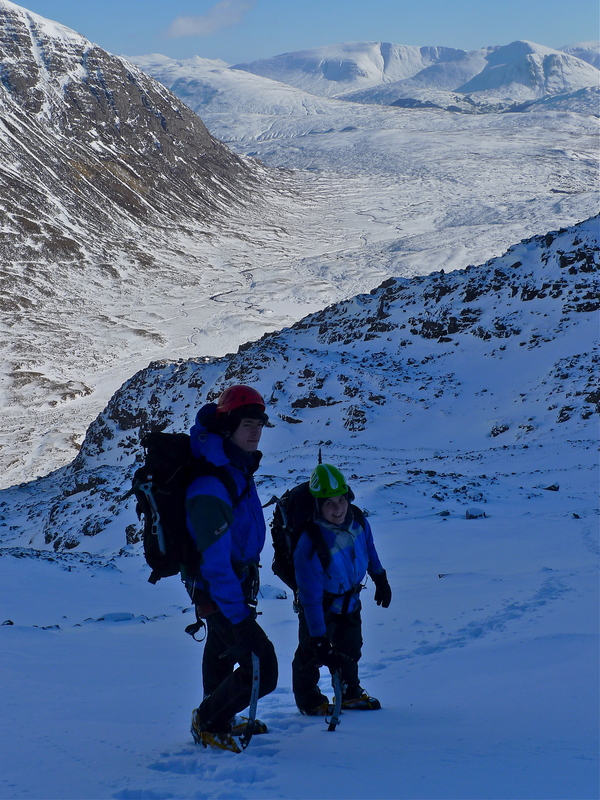 We then climbed into Fionnar Choire which would have given some amazing skiing before reaching the plateau. Here in near whiteout conditions we were forced to do some very real navigation to head for Carn Ban Mor. On the way the clouds slowly parted and we were treated to some spectacular cloudscapes and landscapes. 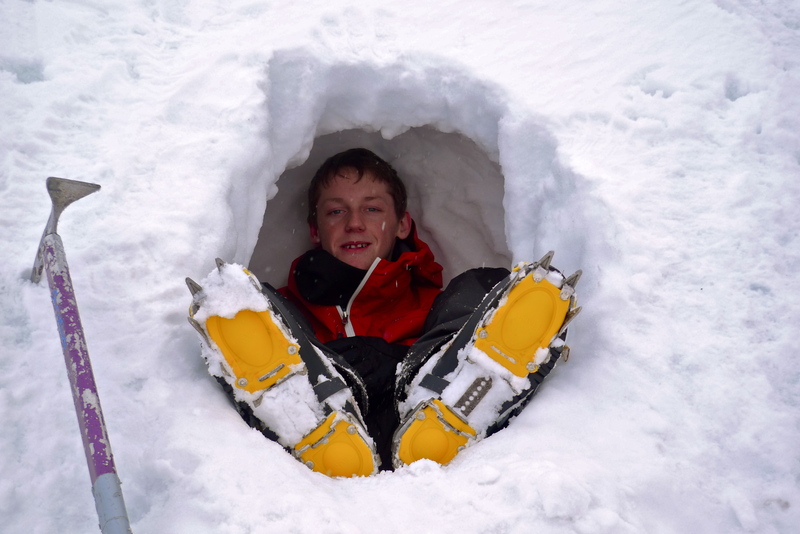 We did not see another person all day nor any foot prints on the plateau – a real wilderness day. 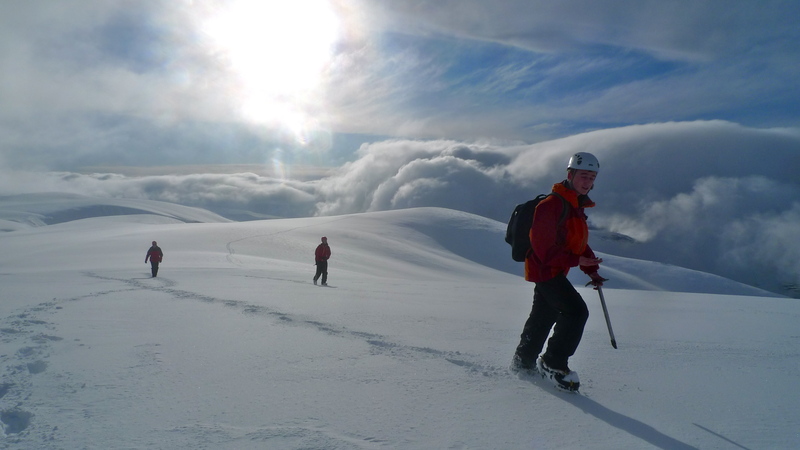 The conditions for ski touring conditions in the cairngorms looks exceptional at the moment. The thaws of a week or 2 ago have consolidated much of the snow pack and most of the snow that has fallen since then has fallen on light winds. 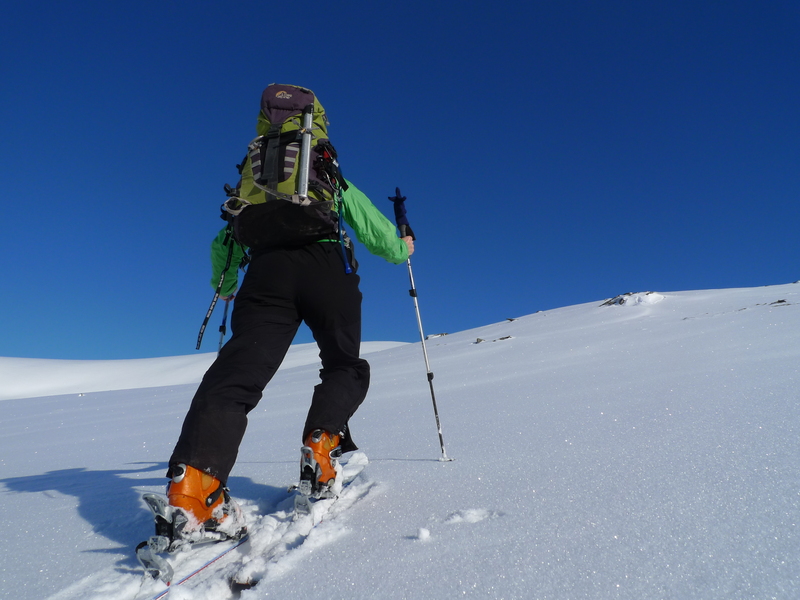 I saw no hard or breakable crusts on any aspects and saw several possible descents of over 600m on great soft snow. Of course usual observance of the avalanche report and current conditions on the hill will need to be observed. Despite the great climbing conditions in wales at the moment, today I made the long drive North to Scotland. I will be based just outside Fort William for the rest of the winter and available for winter courses and guiding here on the west coast or elsewhere in Scotland. I still have availability in February and March so please get in touch with your ideas and we will endeavour to make them a reality. There is snow down to sea-level on the west coast but no-where near as much snow as over on the east coast. Plenty of low level ice-falls that rarely form are now in condition and with the cold spell set to last a while yet this situation should not change in a hurry. The attached photo was taken as I drove across Rannoch Moor this afternoon. The weather really was as good as it looks. 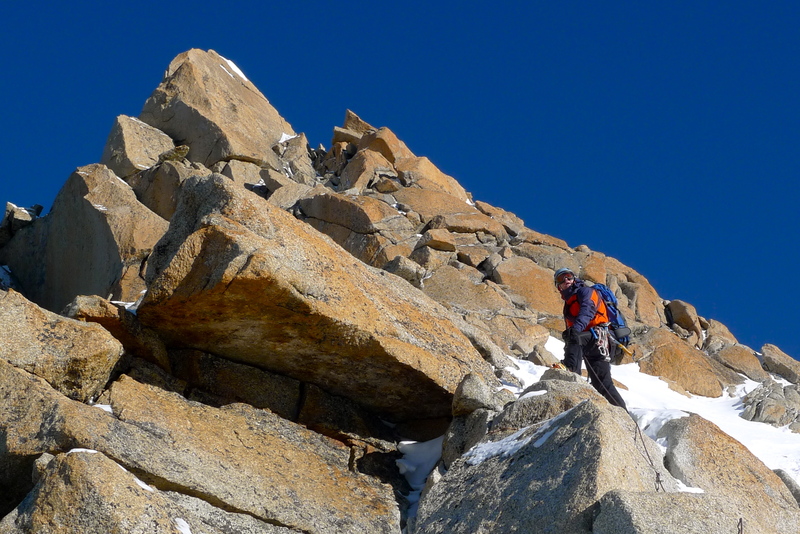 Just back down from 2 days up at the Midi. Plans for long snowy couloirs were quickly changed due to the bitter cold temperatures. Instead we were in search of sunshine. A quick ski down from the midi station and a skin to the old Abri Simond hut to stash some kit where we decided on an ascent of the Cosmiques arete. 1 – because it was in the sun. And 2 – because we could have a warming drink at the top in the midi station. 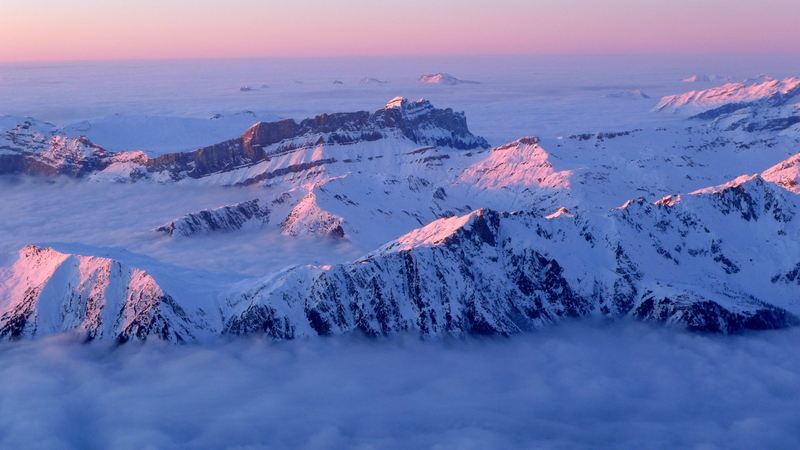 Although it was desperately cold the weather was perfect and we were above an amazing cloud inversion in the valley. That night we joined 2 other young British lads for in the Abri Simond. 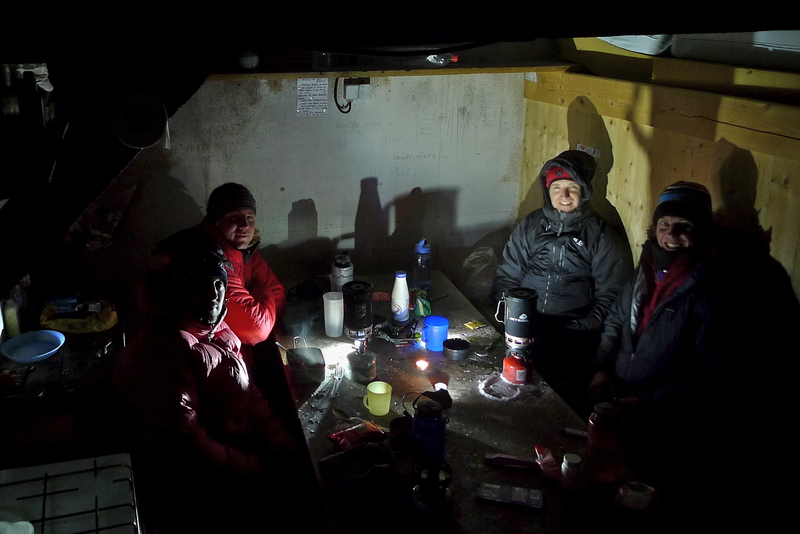 With 2 stoves on the go continually melting snow we managed to get the temp inside the hut up to balmy -5 deg C! 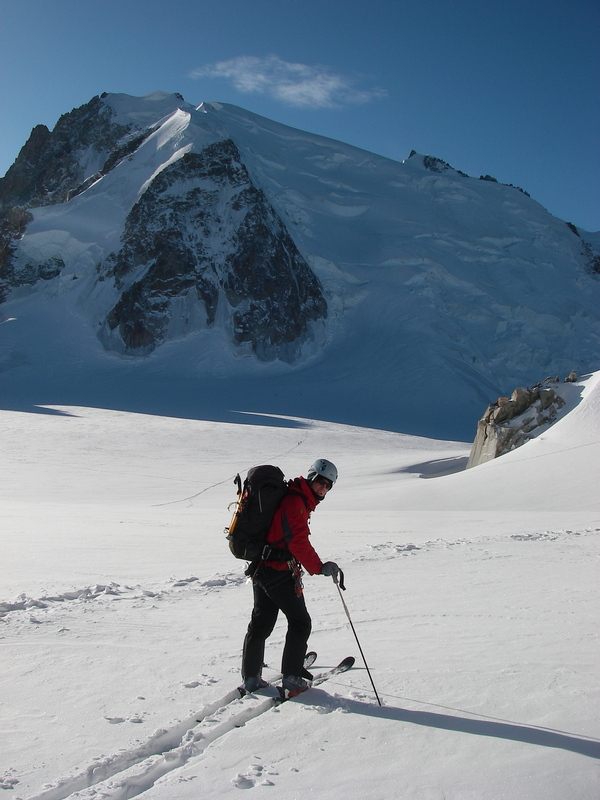 Next day we put ALL our clothes on and headed for the Chere couloir. Hard grey ice on the apron was pretty unpleasant but once in the couloir there was a line of kicked steps and pick placements up the hard ice to make it enjoyable if still baltically cold. All that remained was the sprint back up the arete to catch the last bin down with just 5 minutes to spare. With the wind forecast to gust to 80mph it was a tough call to go and attempt the Ballachulish Horsehoe. However as we started the climb the wind was only noticeable by its absence. We roped up for the rocky steps high on the ridge and by then the wind was picking up quite quickly. By the summit of Sgorr Bhan it was very strong but all the group were moving well and enjoying the challenging conditions. The decision was taken to continue with the journey. The wind rose even more on the final climb of Sgor Dhearg but we only had to move a very short distance north from the summit cairn to get almost total shelter from the gale force southerly winds. 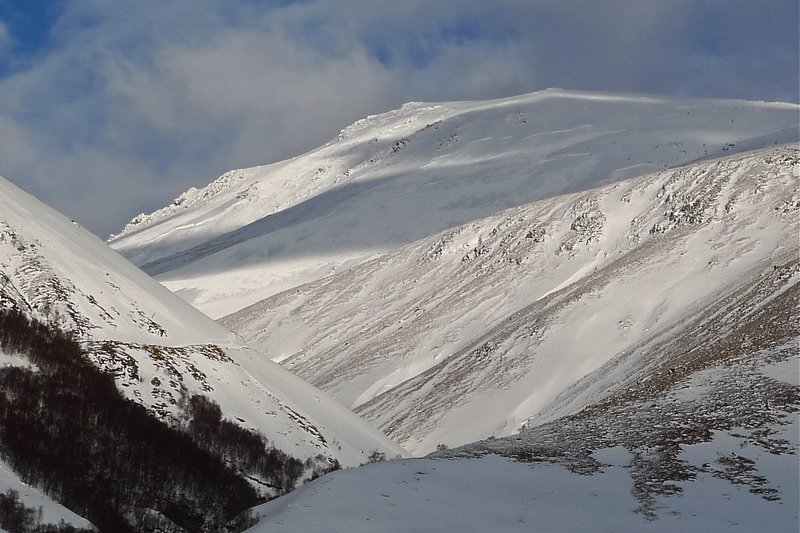 Quite a lot of snow has now gone from the lower slopes and with a thaw forecast at all levels on Friday and Saturday and much colder weather due next week the snowpack should firm up considerably and climbing conditions greatly improve. On these pages we hope to keep you informed of what we have been up to recently. Over the winter months we will try and upload pictures and movies regularly. We hope that these along with the written reports on the weather and climbing conditions will help keep you informed on the current situation. 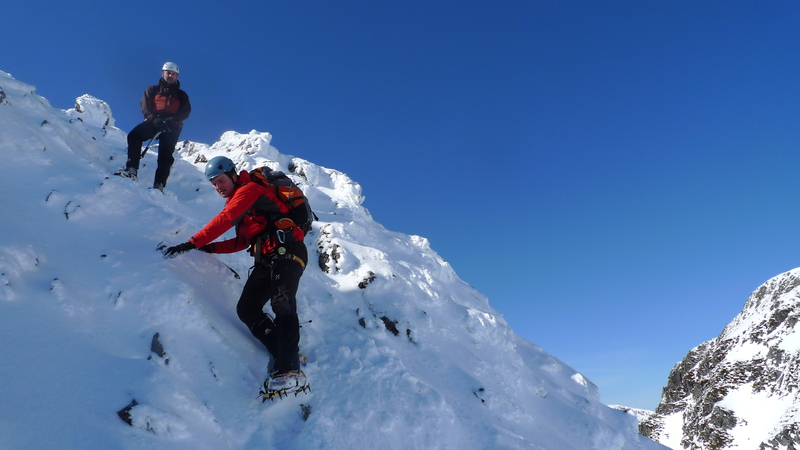 Climb-Mountains offers personalised instruction and private guiding in all aspects of Rock Climbing, Scrambling, Navigation & Winter Mountaineering. Punta Arenas, Chile – Antarctica here we come!